Viral Conjunctivitis is an inflammation (swelling) of the conjunctiva (the outermost transparent covering of the white of the eye and the inside of the eyelids) in the eye. This inflammation may lead to redness, tearing, discharge, itching, and pain. How does Viral Conjunctivitis spread? Viral Conjunctivitis epidemics tend to occur in closed institutions (eg, schools, hospitals, camps, nursing homes, workplaces). Direct contact with eye secretions is the major mode of transmission. This can happen by touching the hands of someone with the infection, or by touching contaminated surfaces or objects. Other possible methods of transmission are air droplets and possibly swimming pools. The virus causing the infection can be recovered from the eye and throat for as long as 14 days after the onset of clinical symptoms. What are the symptoms of Viral Conjunctivitis? Typically, patients initially complain of an increasingly severe gritty sensation in one eye, starting from the nasal corner of the eye and spreading laterally. 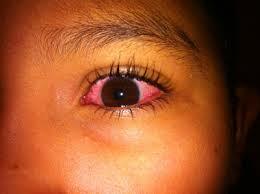 This is followed by marked lid swelling, tearing, itching, increased light sensitivity, and blurred vision. Similar, but usually much milder, manifestations commonly appear in the other eye in two to seven days. The severity of Viral Conjunctivitis ranges from subclinical conjunctivitis to very severe disease with bacterial superinfection and with marked systemic symptoms such as generalized weakness and pain in the limbs. The involvement of the second eye is often so mild as to go unnoticed. A small painful lump in front of the ears may arise in some patients. How can Viral Conjunctivitis be prevented? To avoiding spreading Viral conjunctivitis (EKC), patients should be very careful not to touch others and not to share tissues, towels, or handkerchiefs and to wash their hands frequently as long as the eye is red. In fact, Hand washing by patients and their contacts has been considered the most effective measure for preventing transmission of the microorganism. Children who are suffering from this infection should stay home from school until symptoms have resolved or until cleared by a doctor. They should use disposable tissues to wipe their eyes, blow their nose, sneeze or cough. Cover your mouth and nose when coughing or sneezing. How is Viral Conjunctivitis treated? There is no definitive treatment available for viral conjunctivitis. It is a self resolving condition in most cases and goes away in about 1-2 weeks. Treatment is aimed to relieve the symptoms and prevent added super infection. Avoid self medication and use of over the counter medicines. Some of these medicines may do more harm than good.